Hey, go kill that guy for me, k? Hamm: C’mon, let’s see how much we’re going for on Ebay. A bunch of toys mistakenly think that their owner has outgrown them and might be planning to throw them away. They escape to a day care center where things are not as wonderful as they first seem. 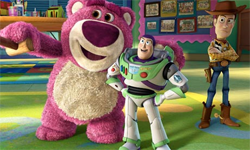 When I started watching this movie, I realized something: I have never really watched the first two Toy Story movies all the way through. For some reason, the storyline has never really appealed to me. And this is coming from somebody who generally likes Pixar movies. It took a few minutes to take in all the characters and figure out what their relationships were, but once I got all that straight, I was able to sit back and enjoy the movie. Maybe not quite as much as others have enjoyed it though. I did like it. In fact, it’s quite good, but still not up there with my Pixar favorites. The thing is, I feel like if I had seen the first two movies a few times, this movie would seem a bit recycled. Even with my limited experience with the first two, it all felt very familiar. Same sort of jokes from the same characters, similar action scenes, etc. It’s all well done, it’s just…tired. In fact, the action/adventure stuff was the least interesting for me. The comedic moments were much better. The introduction of the day care was a good idea. That opened the door for a lot more toys and crazy kids. Still…it just never took me to the same kind of magical place/state-of-mind that something like Wall-E or Finding Nemo did. Does that mean I’ve outgrown playing with toys? P.S. I was going to make a joke about the fact that Ned Beatty should have voiced the pig, but I’m sure I wouldn’t be the first to do that. Also, “Big Baby” is creepy. Don’t throw your toys away kids. If you do, they will suffer a horrible, painful death. could you eat this instead of me, please? thanks. Gobber: And with one twist, he took my hand and swallowed it whole. And I saw the look in his face – I was delicious! He must have passed the word because it wasn’t a month before another one of them took my leg! After a young Viking, Hiccup (Baruchel), wounds a dragon in battle, he befriends it and begins to learn that the dragons his people have been fighting for years might not be exactly what they seem to be. There’s a lot to like about this one, but a few things that hold it back from being one of my animated favorites. First, the good. The visuals are pretty amazing, and I’m sure would’ve been even more stunning in 3-D on the big screen. Still, they’re impressive enough at home in HD. Also great was the story of Hiccup befriending the dragon – which he named Toothless – and his realizations about all of the dragons’ true natures. Obviously there are lessons here about getting to know your perceived enemy and understanding exactly why you’re fighting each other in the first place. All that stuff was handled quite well, but what I wasn’t a huge fan of was the tired storyline of a single father with a son who is not living up to his expectations. There’s nothing inherently wrong with that storyline, but it seems to be a fallback for animated films these days. Off the top of my head, it’s used to some extent in Kung Fu Panda, Finding Nemo, and most obviously in Cloudy With a Chance of Meatballs. It’s just such an obvious and predictable road to go down. Also…Jay Baruchel’s voice bugs me. I know that seems like a minor complaint, but in an animated movie where he’s the star, that can severely hamper a person’s ability to enjoy it at times. The other voices are all fine. His just got on my nerves for some reason. Always carry around a smoked eel if you think there’s a chance that you’ll encounter a dragon. Colonel Quaritch: Shut your pie hole! Humans have discovered a planet called Pandora, rich with life and resources that they want to use. Unfortunately for them, the indigenous, humanoid life (aka the Na’vi) on Pandora lives right on top of the biggest deposit of the mineral the humans are looking to mine. Paraplegic marine, Jake Sully (Worthington), takes his dead twin brother’s place as an avatar that looks just like one of the Na’vi. He plans to help the military by gathering as much information about the Na’vi from the inside, but soon learns that they might be a people worth saving. Ah, original thought…as elusive as Robert Denby and as scarce in Hollywood as the Unobtainium (which should have just been called Oilium) that the humans were searching for so desperately in Avatar. It also seems to be a feared concept, this “originality”. It’s scary for studios to try something new when they know that the tried and true plot lines will rake in millions. Though, funnily enough, it wouldn’t have mattered one bit what the plot of this movie was, as the special effects are the only thing attracting crowds. So why not try something a little different? Why not take the plot in a totally different direction that would leave the audience baffled and unsure of how to view the humans or the Na’vi. Why always make humanity both villain and savior? I guess I probably don’t need to delve too deeply into this movie, as most people have seen it and heard all the complaints. Paper thin characters, weak acting, and a recycled plot with a message that hits you like a sledgehammer. Speaking of recycled, has James Horner lost all ability to write new music? It seems like most of the score of this movie is lifted directly from earlier efforts of his. I could pick out bits from Aliens, Willow, and Braveheart, but I’m sure there’s more movies from which he’s cannibalized himself. When you have all kinds of airships and bombs and missiles that can do the job, don’t send ground troops into a forest filled with deadly creatures and 10 foot tall beings that want to kill you. Flint: We were famous for sardines…until the day the Baby Brent Sardine Cannery closed down for good…right after everyone in the world realized that sardines…are super gross. An inventor, Flint (Hader), living in an island community sick of eating sardines all the time, creates a machine that turns water into food. Unfortunately, his creation is inadvertently launched up into the sky and remains there, converting clouds into various foods. At first, this is a blessing to the towns people, but as the food starts to mutate, it becomes a burden. I found this to be a surprisingly entertaining little movie. The story isn’t groundbreaking, and the characters are pretty standard, but I thought it was funny and interesting throughout. There are a lot of quick, clever little jokes and references that really made the movie for me. The animation may not always be stunning, but it’s definitely a movie where you want to scan the background for funny little moments that you may miss otherwise. It starts a little slow, and the main character, Flint is a little annoying to begin with, but he grew on me after a while. The vocal work is good across the board, with Anna Faris maybe being the highlight for once. Oh, and Mr. T is pretty good too. I should mention the monkey, Steve, as well. He’s voiced by Neil Patrick Harris, though he doesn’t really say much. But there’s a running joke about Steve and gummy bears that has a great payoff in the end. As I mentioned, the main drawback is probably the standard characters. Flint’s mom was always supportive when he was a kid, but his dad has never thought much of his inventions. Of course, the mom died and Flint is left to grow up with his non-approving father. There’s also the mayor who is, surprise surprise, the closest thing to a villain in the movie. It’s always the greedy mayor that screws things up, eh? Sam (Faris) is probably the most interesting character. She’s the wannabe meteorologist who gets sent out to cover a boring non-event because she looks good on camera. She learned early on in life that she needs to hide her intelligence and just coast on her good looks if she wants to avoid being made fun of, but Flint prefers her brainy side. Overall, despite it not being a particularly magical or inspiring story, the script and clever visuals make up for whatever is lacking in the story and characters. For the most part, at least. And you get to see a monkey rip the heart out of a gummy bear and eat it…what more do you want from a movie? mmmm, I could eat stamps all day! Max: When I was young, I invented an invisible friend called Mr. Ravioli. My psychiatrist says I don’t need him anymore…so, he just sits in the corner and reads. A lonely little girl in Australia starts up a pen-pal friendship with a lonely, Asperger’s Syndrome suffering man in New York which lasts for many years. Don’t let the fact that this is a claymation movie fool you, it’s not exactly for kids. There’s a lot of dark stuff going on here, including several deaths, alcoholism, and a near suicide. It makes for much more serious fare than a similarly animated movie like Chicken Run, but it’s so dark at times that some of the sweetness and humor gets overshadowed. There are funny bits, and the end is very touching, but getting there was sort of a battle for me. It’s all just SO dismal that I got a little worn down by it. Still, I have to respect the artistry of it. 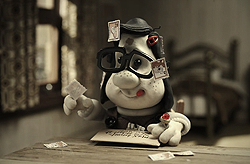 Mary (voiced by both Whitmore and Collette) lives in a world that made up mostly of shades of brown, whereas Max (Hoffman) exists in a very gray New York. When Mary sends Max an object, it always brings that warmer brown shade into Max’s cold existence. While all these uses of color are interesting, it certainly didn’t help alleviate the dismal tone. The voice work is good too, especially by Hoffman. I didn’t recognize his voice, even though I knew it was him talking. So yeah, animation is good, voice work is good, tone is dismal to the point of exhaustion. I liked it to an extent, but I can’t imagine I’ll be watching this one again any time soon. You never know where you might find a friend. #5: Actually, I don’t mind having one eye. It’s easier for me. It allows me to concentrate on just one thing at a time, ya know? A rag doll labeled number 9 awakes in a room, unaware of who he is or why he is where he is. Upon venturing into the outside world, 9 meets others like him while trying to escape from a robotic beast. They venture to a large warehouse and accidentally restart a dormant machine which starts creating more robots whose only purpose is to destroy whatever life they find. This was apparently originally a short film which has now been written into a full movie. It’s pretty apparent too, because there’s not much of a story here beyond the mystery of why these little dolls seem to be alive. Admittedly, I liked that aspect of it, but the characters, and the actions they go through, weren’t quite compelling enough to really make the movie top notch. The big robot thing that they accidentally activate was pretty cool, but I thought they were too over-matched by it to realistically defeat it in the end. It seems like they had to intentionally have that robot not use some of its weaponry in order to even give the dolls a chance to win the battle. Speaking of losing a battle, I thought the back story about the robot/human war was interesting. The animation is kind of cool, but it’s also too drab at times. The dolls aren’t as interesting to look at as the few robots we get to see. Everything is sort of brown and nondescript. It’s definitely not going to compete with Coraline for most visually interesting animated movie of the year, that’s for sure. Overall, it’s a somewhat intriguing movie, with some good scenes and decent enough animation. I just think it’s too thin a plot to stretch out over an hour and a half. Susan: Did you see how strong I was!? There’s probably not a jar in this world I can’t open! On her wedding day, Susan (Witherspoon) is hit by a meteorite which causes her to grow into a giant. She is captured by the government and imprisoned along with 4 other monsters that have been caught. When a humongous alien robot shows up looking for the very substance that turned Susan into a giant, she and the other monsters are called upon to help destroy it. While this movie may not be as witty or enthralling as most of the Pixar movies, I still enjoyed it for its visuals and original idea. In fact, the idea is so good, I think that any disappointment I felt was because I think an even better movie could have been made. It probably could have been a little more imaginative, especially when it comes to the Aliens. The alien leader is kind of dull, and the giant robot he sends initially doesn’t have much personality either. The monsters are pretty good, though. Seth Rogen was particularly funny as B.O.B., the amorphous blob of goo who constantly demonstrates that he has no brain. I think his voice was much more suited for this character than it was for his character in Kung Fu Panda. What was with the human faces, though? I thought the proportions and expressions were borderline creepy at times. Actually, I’m quite certain they were. Especially early on, at the wedding. As I mentioned, it might be funny at times, but it’s not a hilarious movie. This adds to it feeling a little overlong (even though it’s only 94 minutes in length), especially in the second half. But at least their are those nice visuals to take in. I especially enjoyed the view as the military helicopters approached the giant alien robot. Cool stuff. Overall, this won’t be topping my list of favorite computer animated movies, or even cracking the top 5, but it’s an enjoyable ride while it lasts. Just don’t count on it being one you’ll want to get back in line for after it’s over. Cat: You probably think this world is a dream come true…but you’re wrong. Coraline (Fanning) has just moved to a new place with her parents who spend most of their time working and little time paying attention to their daughter. One day Coraline discovers a passage way in their house that leads to a sort of parallel version of her life. This version seems more magical, with more caring parents (despite having buttons for eyes), but there’s something sinister lying beneath the surface of this new world that is trying to tempt Coraline to stay. Even if nothing else was good in it, I’d be glad I watched this movie just for the visuals alone. It really is a sight to behold. Colorful, inventive, and detailed are the words that come to mind. It’s especially impressive on blu-ray. As amazing as CGI characters can look, stop-motion animation brings an added sense of three dimensionality to the images. It also helps add to the creepiness factor, as everything tends to move a little less smoothly. Happily, the story and characters are also mostly interesting and well done. I wish the parents weren’t so inattentive to begin with because this isn’t a story about them learning a lesson. The lesson seems to be that kids should be happy with the family that they have, even if it doesn’t live up to their ideal, but I thought these parents were kind of jerks. Seems like it would have made more sense to start Coraline off as the unappreciative kid, with the parents being more sympathetic characters. Or at least have the parents be a little bit nicer than they were. Then when Coraline realizes that she had things pretty good to begin with, we in the audience would agree. Regardless of that, the movie works. It’s creepy and interesting and weird and, as I mentioned, visually stunning. I watched a little bit of it in 3-D, but I thought it looked better in regular ol’ 2-D because some of the coloration is lost when viewed through the 3-D glasses. I recommend watching it in 2-D first. The voice performances are all good enough, though the best are by Fanning and David Keith (as the Cat). I thought the end almost turned into a sort of video game type plot for a while, but it still worked well enough not to ruin the movie. It just seems like they could have come up with something better than a little quest to find various magic balls of light in order to win her freedom. Yes, there’s more to it than just that, but it felt like a video game character going from level to level, and that distracted me a little. Is there a Coraline video game out yet? I’ll have to check on that. Overall, it’s a quality movie. Good for kids if they can handle creepy imagery, and good for adults if…well, if they can handle creepy imagery as well. Kids, no matter how bad your parents are, love ’em anyways, because it could be worse. They could be trying to sew buttons to your eyes and drain your life force…or something. Can he swing...from a web? No he can't...he's a pig. Russ Cargill: Of course I have. You ever tried going mad without power? It’s boring. No one listens to you! Because Homer doesn’t listen to warnings about Springfield becoming overpolluted, a huge glass dome is placed over the town so no one can leave or do harm to the rest of the world. The Simpsons family manages to escape an angry mob – and the dome – and move to Alaska. When they discover that the next step the EPA is going to take involves destroying the entire town, Homer has decide if Springfield is worth the trouble of going back to save the day. As much of a Simpsons fan as I have been since it first aired, it’s surprising even to me that I had yet to watch this movie. Having become disappointed in resent seasons of the show, I worried I’d be equally unimpressed with the movie, but as it turns out, it was actually pretty darned good. Sure it has moments that fail, but those are outnumbered by the moments that work. And yes, there are characters that I would have liked to see more of (like Mr. Burns), but there’s only so much time to fit everybody in. I liked the fact that they made a role for Albert Brooks too. He’s always been good when doing voices on the show before. The plot is a little thin, and nobody ever even suggests digging their way out under the dome, but all that can be forgiven because it’s, ya know…a cartoon.